Which Wedding Band Should You Wear with a Halo Ring? Home » deBebians Fine Jewelry Blog » Which Wedding Band Should You Wear with a Halo Ring? Halo engagement rings have risen in popularity over the last few years. They are a wonderful way to add total carat weight to your ring without adding strain to your budget. Maggie wrote a wonderful blog post about how adding a diamond halo makes the center diamond appear larger. Today, I want to discuss a couple of wedding band options that one can wear with a halo ring. 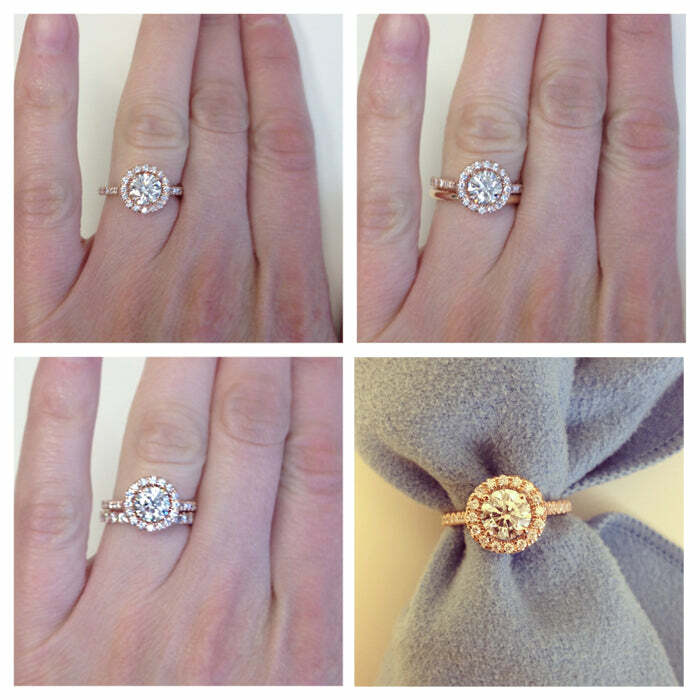 These photos as showcasing one of our most popular engagement rings, a round halo ring (style # HE128) in rose gold. This ring features the most popular diamond shape, a round diamond, surrounded by a pave diamond halo. The ring also has a pave diamond band. This ring is stunning on its own, but it also looks gorgeous when paired with a number of wedding bands. I have paired this engagement ring with a 2mm rose gold wedding band (style # BL2P14). This band gives a nice contrast to the pave band of the engagement ring. The 2mm width matches the width of the engagement ring and sits flush. This ring is also tasteful when worn alone and can be stacked next to other rings in the future. The second wedding ring I have paired with this halo ring is a 2mm u pave eternity band (style # BLDUSE200S-14). This band gives a little extra sparkle while not being overpowering. I love the versatility of this band and personally feel like it is one of the most beautiful rings that we offer on our site. This engagement ring can be paired with many different diamond wedding bands. If you would like assistance in finding an ideal ring for you or someone you love, please do not hesitate to contact our GIA graduate gemologists and jewelry experts.